Above any other medium of advertising, aerial letter banners are the most memorable. Are you looking to get your prospective customer’s attention? There are many studies and statistics that show that people pay attention to banner ads and moreover, they tend to remember the pieces of information written on them. That makes it more likely that they will remember the advertised product and act on the ad. Letter banners are great for any occasion. Wish someone special a “Happy Birthday”. Or are you looking for a unique way to propose? “Will You Marry Me?” These special and personalized messages can be created and transformed into a memory that can last a lifetime. Whether personal or business-related, your banner message will be remembered. SETUP - Letter banners can be created for the next day or even same day. 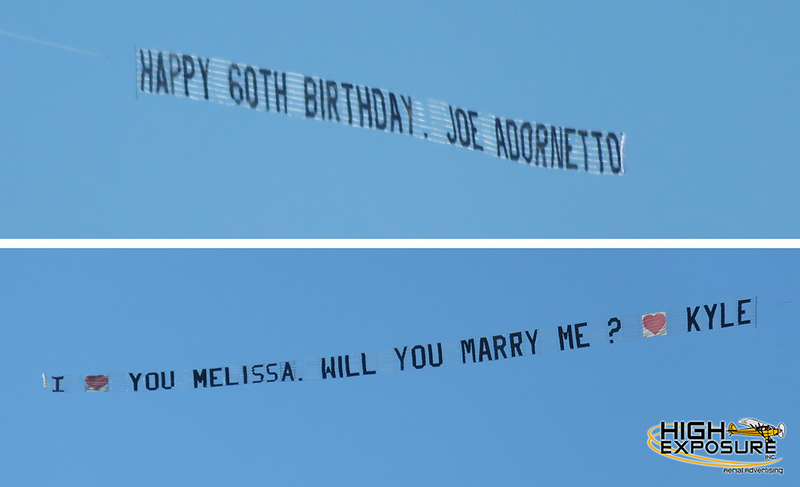 MESSAGES - Shapes such as hearts are available for "I Love You" or "Will You Marry Me" airplane banners. Create up to a 45 letter Banner. SIZES - Letters are 5 feet tall in either red or black.